So. Last we left my living room I had rearranged the furniture and come up with something that mostly, kind-of-sort-of working. Not bad, sure, buuuuuut... not quite there, right? Many of you noticed it. The armoire. It's great and all, but it's not working. The whole room is oriented toward that armoire. And the only reason the armoire is there is to provide a space for us to get a TV. But we don't watch TV on a TV anymore, we watch on laptops. Take out the armoire, and then what? It's just blank? We can't focus the room entirely on the fireplace because of it's position (it's half in the entry hall). And hey, wait a minute, what exactly is this room for anyway? ...a TV room? No, we prefer to watch TV in the family room. ...a place for the piano? No, I prefer having the piano in the family room so the kids have easy access. ...a dining room? This one I put some long and hard thought into, because it's a good idea as I don't have a formal dining room. But in the end I said no because (a) I prefer having closer access to the kitchen for the dining room and (b) I wanted a softer space as the first entry into our home. (As in, literally softer, like, with squashy furniture). SO confusing. I kept thinking and thinking and weighing pros and cons and just thinking myself into circles. Thinking sometimes isn't the best tool. My living room has no purpose. If that's true, then I can make the room be ANY WAY I WANT IT TO BE. Oooooh, now that's an interesting thought. A whole room that can be designed purely for me, my comfort, my joy. I like it. I pulled the armoire out, played with some different ideas, got the chairs situated and put the armoire back. Much better. 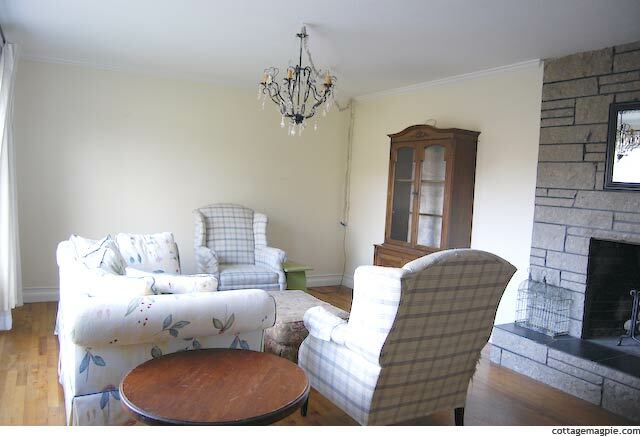 The room feels much more inviting and cozy, and you can still see the fireplace from the couch. Here's another view. Now, to take this picture I had to stand in the hall, which might give you an idea of just how wonky that fireplace is. Oh yes, and the ottoman is just a placeholder. Not bad. But I'm still not sure about the armoire. It's nice that it balances the fireplace. BUT. It's kind of just floating on that big wall. The fireplace should be the star, for sure, but that wall is the balance to the fireplace. I think it needs something bigger or wider. (I could be wrong, speak up if so!) Turning once again to the computer, let's paint out the armoire. Aaaaah, that's better! The whole room is better! But, like we said, that wall needs something. Although, then what do I do with the wall next to the fireplace! Leave it blank? DO something simple, maybe a few botanical prints or something? I was digging around the InterWebz looking for ideas and found this great wall shelf. Really cool. But it was too big for the fireplace wall. I could move the mirrors to the side and put it over the console maybe? Not bad either. But maybe too cluttered? Hard to say. I do like that. It's nicely balanced. Maybe still too cluttery with the mirrors. Maybe the mirrors need to wait for another room, I don't know. I do love the direction things are going. Much better. And I already know I want to slipcover all the furniture (using fabric I have on hand or can scrounge up on the cheap) and fix up the end tables and such. So I have some projects to work on. I will probably not get a lot done over the next couple of weeks, but I can share some Christmas crafty stuff and ponder all these options. I'm definitely considering moving the chandelier. I could use it in the dining room area, and some great lamps would be great in here (as many of you suggested). I really appreciate all of your thoughts and ideas! It's like having a personal design team! So, what do you think? Does any one option look WAY better than the others? Are they all pretty much the same? Or are they all a mess? What would you put on that wall? And what do you use your living room for? And since we're asking lots of questions -- do you like this big blog posts with lots of pictures? Or would you like it better if I posted more often but it was broken up into two or three bite-sized posts, more "as I go" type of thing?